While there's no word on exactly when the S Blaze 4G will be available, we'll be here to track any relevant details as they emerge. In the meantime, check out the full release below for more information. BELLEVUE, Wash. — Feb. 22, 2012 — T-Mobile USA, Inc. and Samsung Telecommunications America (Samsung Mobile), the No. 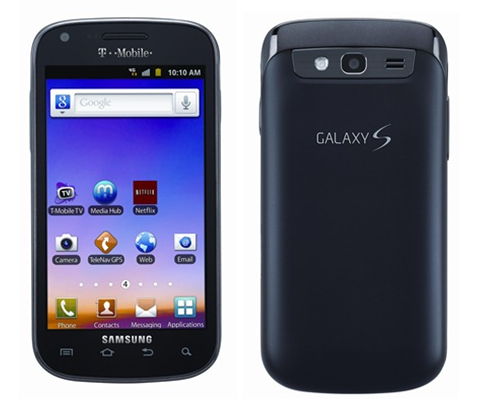 1 mobile phone provider in the U.S.,1 today confirmed the upcoming March availability of the Samsung Galaxy S® Blaze™ 4G, exclusively from T-Mobile®. 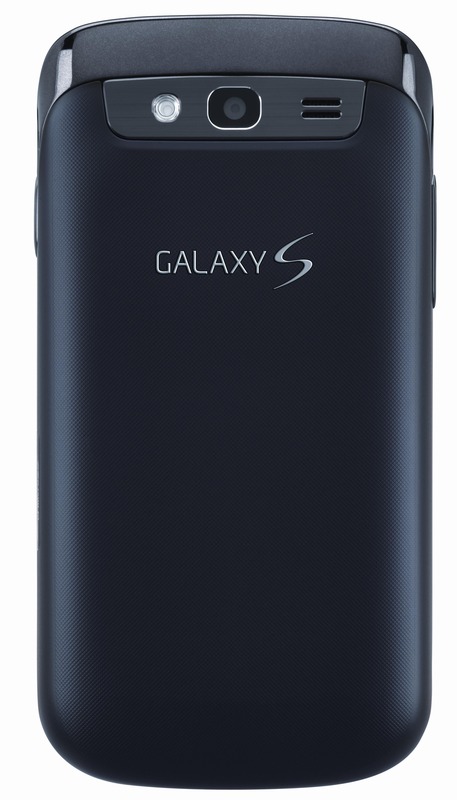 The Galaxy S Blaze 4G is the latest addition to the successful Galaxy S line of products, and T-Mobile’s newest fast 4G smartphone to take advantage of 4G (HSPA+42) technology, providing customers with the ability to browse the Web faster than the average home Internet2 connection while on the go. Consumers are increasingly demanding more from their smartphones — keeping them entertained, staying connected with loved ones and enabling them to complete more tasks using a single device. A recent T-Mobile survey3 found 79 percent of smartphone users are less likely to carry other technology devices, such as cameras, laptops and GPS devices, when they have their smartphone. T-Mobile’s newest 4G smartphone offers a variety of features and applications to help consumers be entertained and have access to the information they need when they need it. The Galaxy S Blaze 4G entertainment offerings make it easy for T-Mobile customers to stream their favorite movies on Netflix®, enjoy live or on-demand TV programs on T-Mobile® TV in mobile HD4 or download a popular movie or TV show using Samsung Media Hub. Additionally, the smartphone features TeleNav GPS Navigator, which provides hands-free, voice-guided turn-by-turn driving directions, real-time traffic alerts, full-color 3-D moving maps and local alerts, helping customers get to where they need to go. 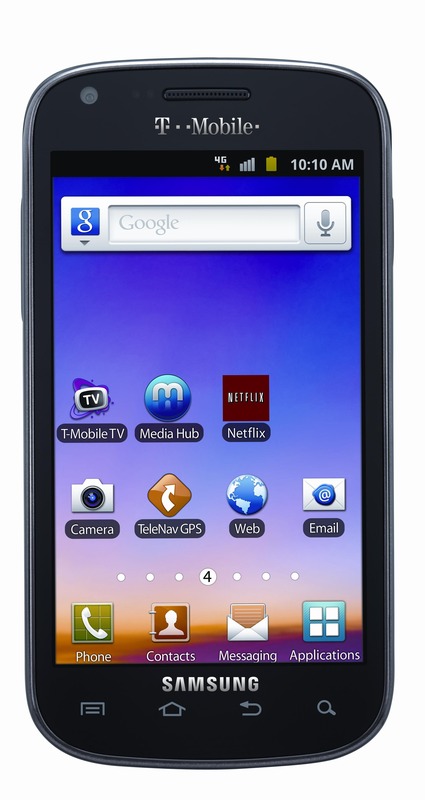 The Galaxy S Blaze 4G also comes preloaded with a customized version of the Yelp mobile application, featuring the ability to save profiles so users can keep preferences the same with one touch in any city, making it easy to find and read reviews for local places to eat, shop, drink and play. Also pre-loaded on the device, the T-Mobile 4GPro App Pack offers an aggregation of key business applications, such as DropBox, Evernote, Square, TripIt, Camscanner and LinkedIn, helping busy consumers be even more productive while balancing their professional and personal lives. Featuring a sleek and stylish form factor, the smartphone comes in a carbon black color and runs on Android™ 2.3 Gingerbread. The Galaxy S Blaze 4G also features a Snapdragon™ S3 processor by Qualcomm® with 1.5 GHz dual-core CPUs and a beautiful 3.97-inch Super AMOLED™ touch screen providing consumers with a rich experience watching their favorite movie or TV show on the device. The Galaxy S Blaze 4G also makes it easy to connect and share photos and video with loved ones. It features a 720p HD video recorder, 5-megapixel camera with 4x digital zoom, flash and advanced shooting modes, as well as a 1.3-megapixel front-facing camera for video chat. 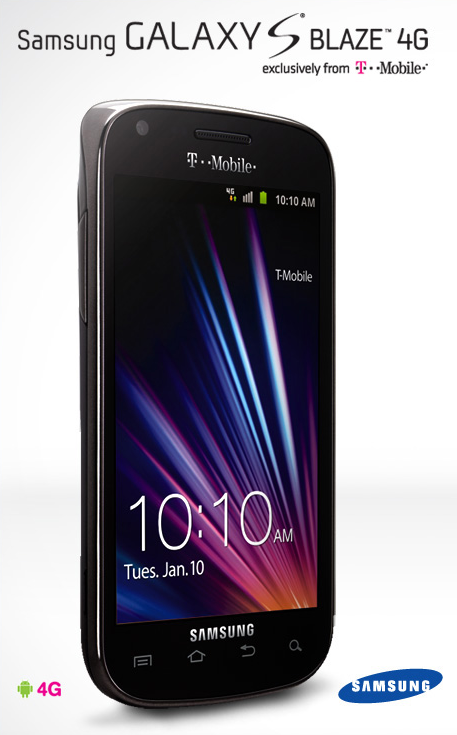 The Samsung Galaxy S Blaze 4G is expected to be available at T-Mobile retail stores, select dealers and retailers nationwide, and online at http://www.t-mobile.com starting late March. The Galaxy S Blaze 4G is expected to cost $149.99 after a $50 mail-in rebate card, with a two-year service agreement and qualifying Classic voice and data plan. For more information, visit http://galaxy-s.t-mobile.com/samsung-galaxy-blaze.